Zoro flashes back to his training with Mihawk, who told him “that having chips on the blades of his sword is an affront to his honor” and “he should use Busoshoku Haki to prevent it“. Everyone reacts to Pica’s defeat, and the SMILE Factory is destroyed by the Dwarves. Kyros releases that they must leave Doflamingo’s defeat Luffy and Law. When it is noted that Doflamingo’s “main forces only have three members left“, Viola corrects them telling them that there is “only two left now because another battle has just been decided“. Luffy defeats Bellamy with one hit. Luffy stands over a K.O’d Bellamy and recalls their fight. Bellamy hoped that his decision to attack Luffy, would get “Doflamingo to remember him“. Luffy stated that “Doflamingo only wanted Bellamy to be pitted against him and die from the beginning, which Bellamy admitted was likely correct before claiming it is his dying wish to fulfill this“. Bellamy told Luffy to “just stand there and die if he did not want to fight back before leaping toward him“. 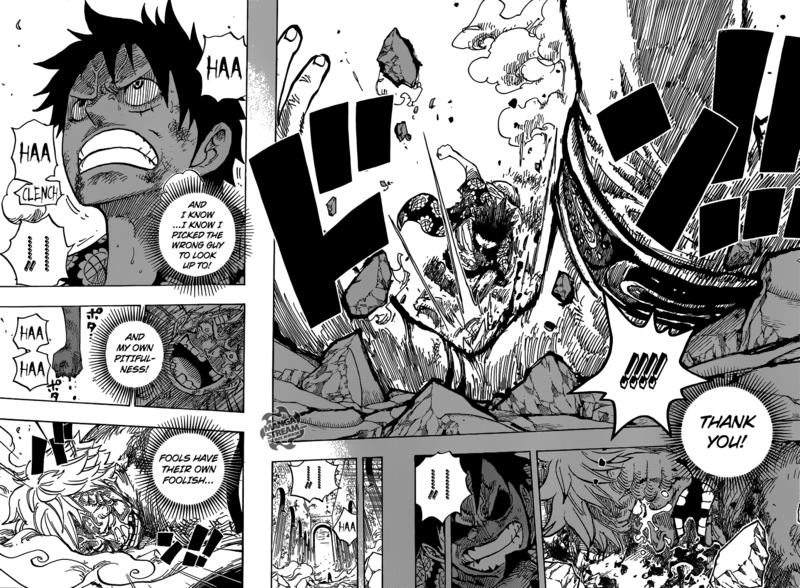 Luffy punches Bellamy with a “Busoshoku Haki-hardened Gear Second punch“. He loudly screams Doflamingo’s name, who notes that Luffy is in for a “rude awakening“, when he sees Law’s “lifeless corpse“. 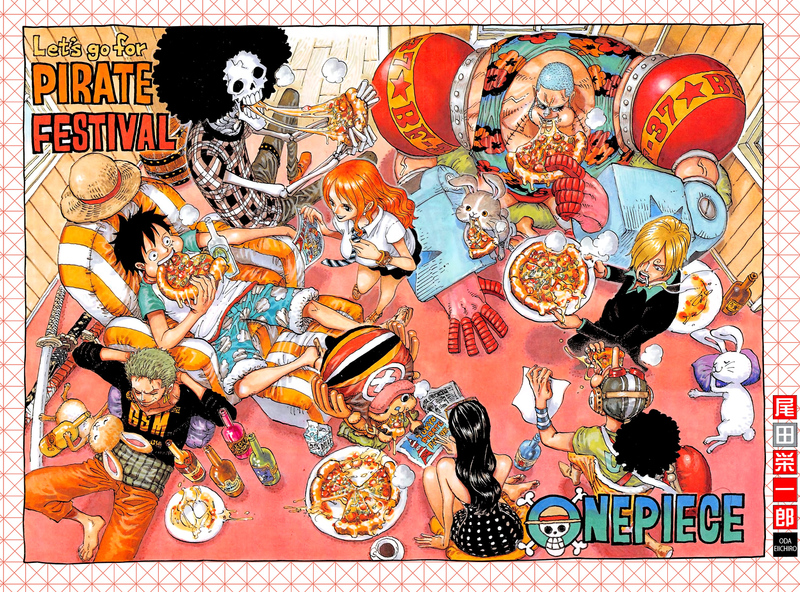 Finally, we are getting to the main attraction, Luffy verses Doflamingo. Is Law dead? I doubt it? However, I think that if he was killed by Doflamingo that would enrage Luffy to the point where he would definitely, beat the hell out of Doflamingo. Other than this set up, most of what occurred was cleaning up. When Luffy is pissed he is almost impossible to defeat, I can’t wait till the net chapter (coming in two weeks). Aizen asks Shunsui “What’s wrong“, suggesting that he should use the other two keys. Shunsui unlocks Aizen’s left eye and ankles, and asks him “how it feels“. Aizen states that Shunsui “has not changed“. Shunsui asks Aizen “if he wants to leave“, Aizen says “he never asked Shunsui to free him“. Aizen notices that Shunsui has “more keys” within his body. Shunsui says that the key to “Muken has been buried in is heart“. Aizen notes that the “Central 46 predicted that he might kill Shunsui for the keys and that he would be trapped within Muken forever if he did“. Shunsui asks Aizen to sit in a chair, so he could take him to Seireitei. An attendant attempts to bind Aizen, and has his hands destroyed. Aizen asks him “if he wishes for him to lend his powers to Soul Society“. Shunsui says they “simply in a situation where the advantages and disadvantages are similar for them“. Yhwach try’s to destroy the Soul King, again but Ichigo stops him.Yoruichi places a barrier around the Soul King and Mimihagi. Meanwhile, Yhwach asks Ichigo “why he is getting in his way despite being the one who cut the Soul King in half and notes Ichigo’s Quincy blood cannot forgive the Soul King’s existence“. Ichigo says “he came here to protect all of three realms“. He uses “Getsuga Tensho” on Yhwach, he knows that Yhwach blood flows through his body. He states “this does not mean Yhwach gets his way”. 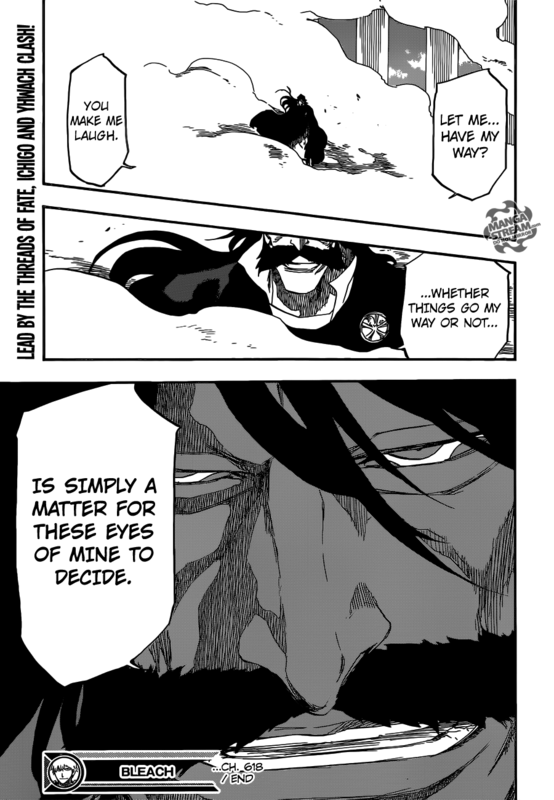 Yhwach responds it “dependents on his own eyes”. This chapter was underwhelming, even though the conversation between Shunsui and Aizen was interesting. I still don’t understand why Aizen would change his mind in regards to destroying the Soul King. 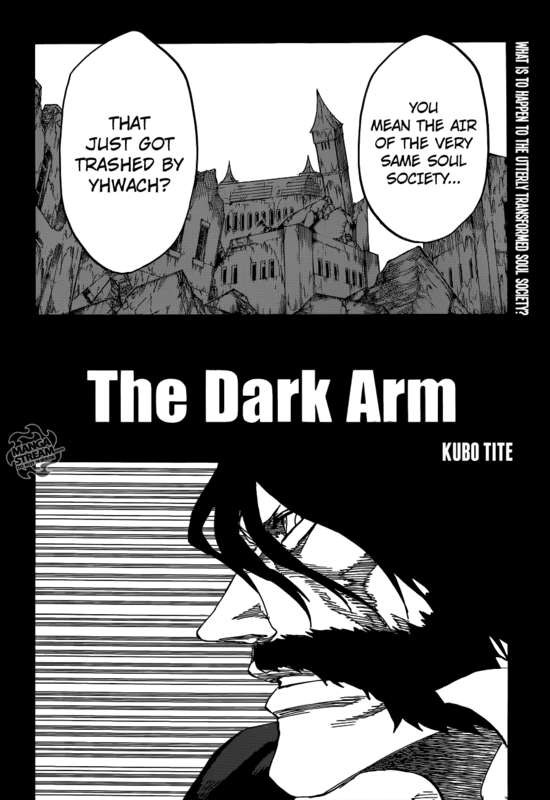 Why did he turn Yhwach down? What was their conversation like? As for Ichigo verses Yhwach, I expect this to be a long draw out fight and we’ll likely see the others (Gotei 13 and Elite Sternritter) complete their fight first. Previous Post Dragon Ball Z Rebirth of F – Special One Shot 1of 3.